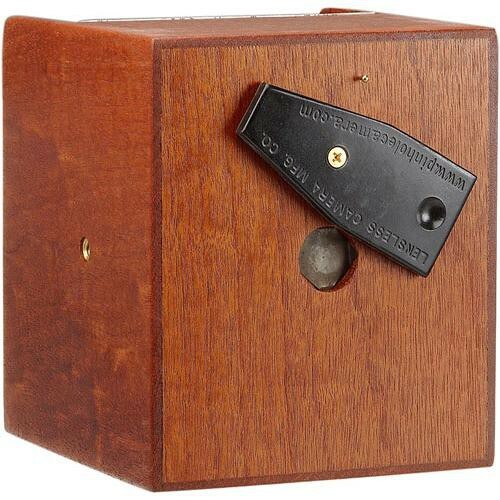 The teak wood 4 x 5" Pinhole Camera from Lensless features a 3" focal length. Lensless Cameras are constructed of different woods. Each model has a tiny hole (1/64" or smaller) precisely drilled in the front panel. The shutter is simply a small hinged metal plate that the photographer swings up and down to begin and end the exposure. The focal length is determined by the length of the camera. The format is determined by the size of the back of the camera, which accepts the film holder. Since it is designed to accept a sheet film holder, there is no need to load the camera in the dark. This is a teak wood, 4 x 5" Pinhole Camera, with a focal length of 75mm, which is a wide angle perspective for this format. Average exposure in bright, noon-day sun is 4 seconds, using 400 ISO film. Simplify photography to its basics: Composition and Exposure. Depth of field is of no concern; everything in front of the camera is equally in focus. Uses cut film and Polaroid holders. No need to load the camera in the dark. Film Format 4 x 5"
Box Dimensions (LxWxH) 6.7 x 6.5 x 6.1"
How to you compose with this? Also, what is the thickness of the pinhole plate? Just point at something and see what you get. That sort of freedom is the fun of pinhole shooting. But if you want control, an old Zeiss or Leica 24 mm external viewfinder gives you roughly the same field of view as the 75mm Lensless Camera. As for the plate thickness - no idea. Pretty thin though and well machined, as the IQ is really good - given that no pinhole will ever give you the kind of sharpness rendered by a lens.